Shop with Friends and Family Before heading to the mall! So what do I mean “Shop with Friends and Family before heading to the mall?” Take a look around you and notice who you know that has their own business. They may be able to help you clean your home, style your hair, massage away your aches and pains; shop for jewelry, clothing, undergarments, chocolate, coffee, skin care, vitamins, home cleaning products….there are hundreds of small businesses and direct sellers in your life – you just need to pay attention and take a look at what they have to offer you and your family. I have noticed that many people feel that these small businesses will cost more than if they just “run out to the mall” and shop with the big box stores. I encourage you to step back from this belief….because in many cases, your friend or family member who has a small business probably offers you better quality, pricing, SERVICE than the store down the street. Take the time to seek real people out, learn what they have to offer. Once you have shopped with them, in the long run – I bet they will save you time, money and give higher value with excellent customer service. Then feel good about your actions – you will be supporting someone who has made the small business choice so they can take care of their family and friends. 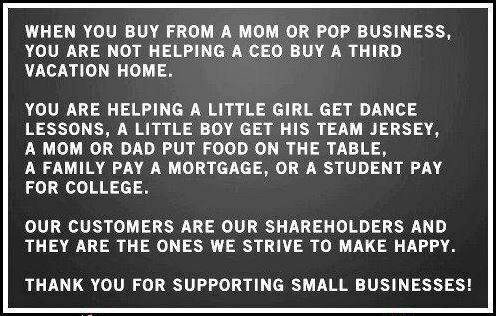 This photo I found on Facebook says it all…..WHEN YOU PATRONIZE A SMALL BUSINESS, YOU MAKE A DIFFERENCE! Many times a BIG difference. I have been a small business owner for 35 years….21 years of that I was a single mom who for 10 of those years cared for my mother at home. Trust me when I say to you that the people who visited my salon, attended my nail school, hired me as an industry trainer, and then shopped with me as a direct sales person made it possible for my family to avoid going on welfare. To provide for my family…to be able to pay for the necessities of life like food, gas, rent, health and dental insurance that we needed since there were no monthly support checks coming from anyone. We survived and many times I was able to do a bit better than just get by…..thanks to the people who made a point of shopping with me before they headed to the mall. HUGE THANK YOU!! I have enormous gratitude for the amazing people who have supported my family over the last 35 years. Now a bit of advice and coaching for those of you reading this who have a small business….please walk your talk. 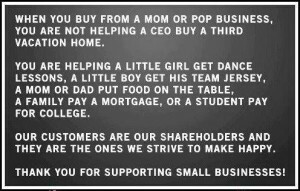 We ask our friends and family to do business with us….you need to be sure that you are doing business with small business! Shop with friends and family applies to you too! Be aware of what you post and say on Facebook. I see many small business people endorse a retail hair or skin care product when a quick peek at their friend list will reveal that one or many of their friends who are working hard to sell that same type of product! I am not saying don’t shop at Costco or Nordstrom’s…just be sure to buy the things you can from those who are in need of your support. Most of my wardrobe has been purchased from a small business person and I can give you their name and contact info when you compliment me. I strive to connect people. So if you need a service or product, let’s connect and I will give you names of people you can trust. People who are professionals and will take care of you like gold….because to us small business folk – you are worth your weight in gold!